The public spiritedness of the new American Congress was widely admired in 1775. It was a heady time, as members of Congress forged from their political ideals a working blueprint for constructing an army (which Franklin hoped would reach “above 20,000 Men”), developing an intercolonial empire of goods in the absence of Britain’s trade restrictions, and determining a common means to fund intercolonial trade and thus support a war effort against Britain. For over a decade, colonial Americans had been working to consolidate political activity by refusing to purchase the goods that Britain chose to vend in North America. The colonists’ non-importation agreements extended across the colonies; instead of buying goods manufactured in Britain, colonial consumers were bartering for and buying products and manufactured goods from other colonies. Austerity, a keyword of the non-importation movement, brought internal prosperity. Congressional resolutions and petitions increased from 1775 into 1776, and Americans prepared for war. The colonists could no longer be forced to import British “superfluities” (Franklin’s word for British goods), but they would need to develop a currency system printed and monetized by the colonies alone. 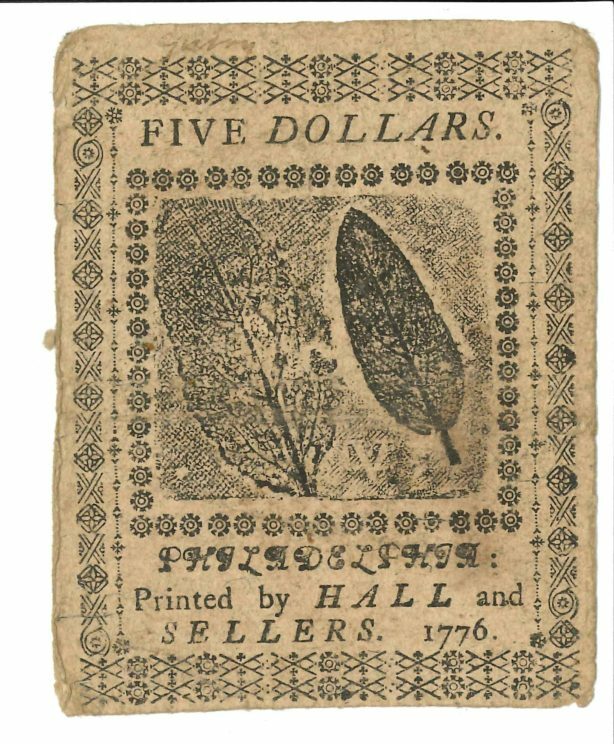 Given his skill—he had studied economic systems in the Atlantic world and was the first to devise a system of colonial paper bills that were difficult to counterfeit—Franklin was appointed to design, secure copper plates for engraving, and oversee the printing of Continental paper currency. Franklin was busy! He established a wartime postal service, worked on manufacturing saltpeter (used for gunpowder), wrote an olive branch (peace) petition to King George III, and served as President (essentially, governor) of Pennsylvania. 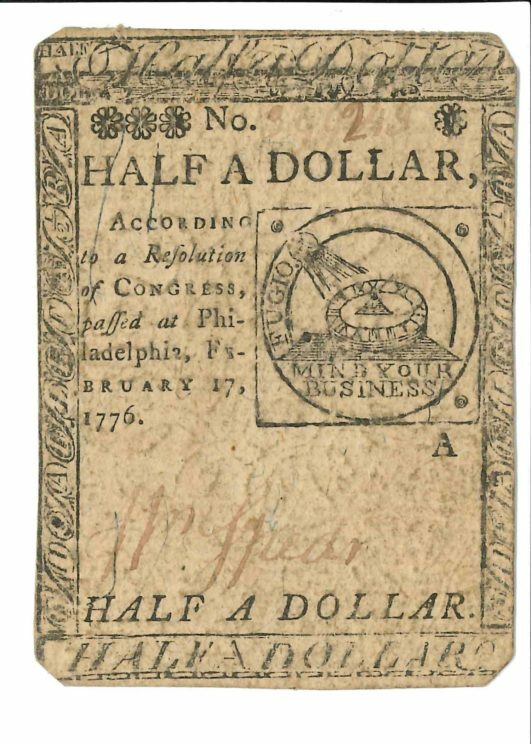 Even so, Franklin developed ten designs for paper currency bills. In creating these designs, Franklin revisited two favorite pastimes from earlier in his life: printing leaf designs (which made counterfeiting difficult) and reading through emblem books to find adaptable designs. 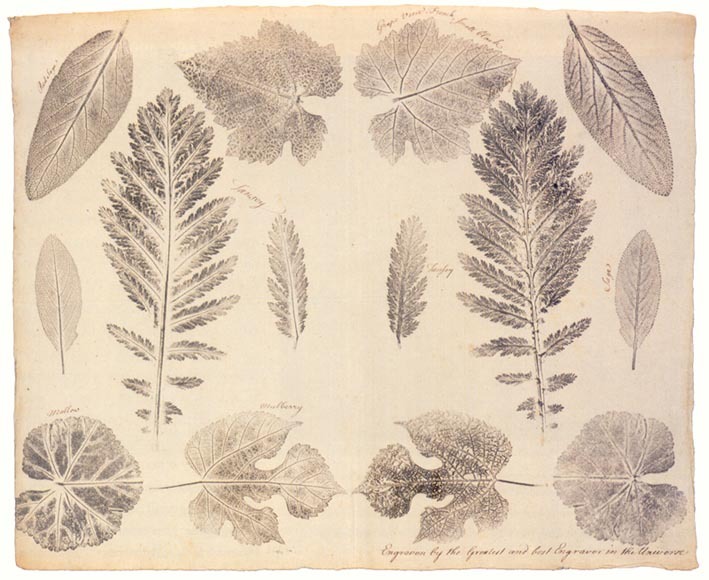 Joseph Breintnal and Benjamin Franklin, Nature Prints of Leaves, Philadelphia ca. 1740. Credit: The Library Company of Philadelphia, used with permission. 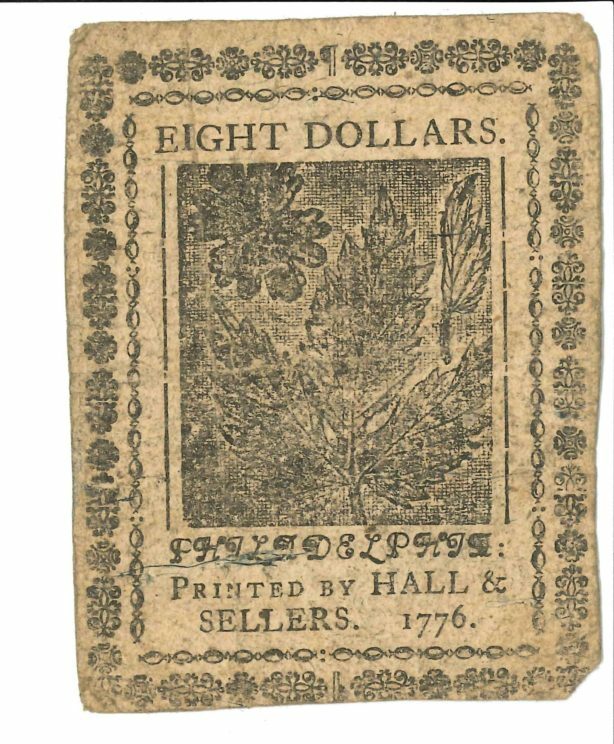 In 1776, as he worked on designs for new paper bills for intercolonial use, Franklin fell back on his old leaf printing designs and used them on paper bills. Credit: Private collection, used with permission. Franklin also recuperated his lifelong interest in creating symbolic designs that would have meaning as they were being exchanged. He used his favorite emblem book, Joachim Camerarius’s Symbolorum ac Emblematus Ethico-Politicorum (Latin for “Ethical and Political Symbols and Emblems”). Camerarius’s book was popular and was reprinted often. Franklin’s own copy of the book was a German publication from Mainz, dated 1702; it is housed at the Library Company of Philadelphia, the library Franklin began. These interlocked circles were used on different issues of continental bills across 1776, on a New Hampshire regimental flag in 1777, on a Massachusetts company flag, and eventually on a set of china that Robert Morris asked Josiah Wedgwood to create for him when he served as the U.S. Agent of the Marine. Franklin also devised a “Fugio” image, which on many bills formed the reverse of the interlocked circles side. This image featured a design of the sun shining down on a sundial (a measure for time). On the connecting lines is written “Fugio,” meaning “I flee” or “I fly,” thus reminding viewers that time flies. Franklin added the motto, in case the point would be missed, “MIND YOUR BUSINESS,” implying that no American should misuse time nor do anything inessential to the task of securing American economic freedom from Britain. 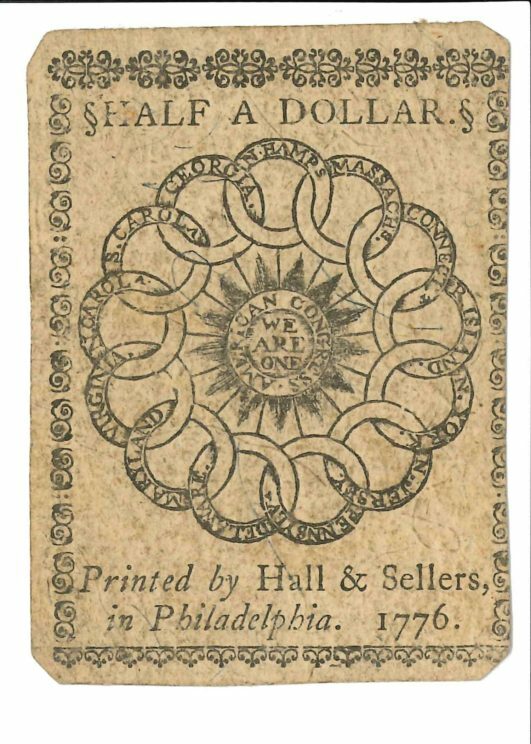 This Fugio design with the interlocked circles on reverse appeared in a number of issues of paper currency in 1776. 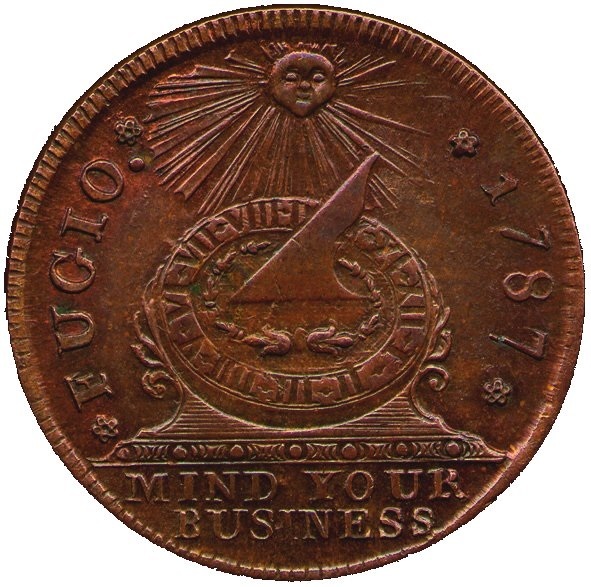 The Fugio cent, a hard currency, was later authorized by Congress (in 1787) as the first official copper penny of the new government. 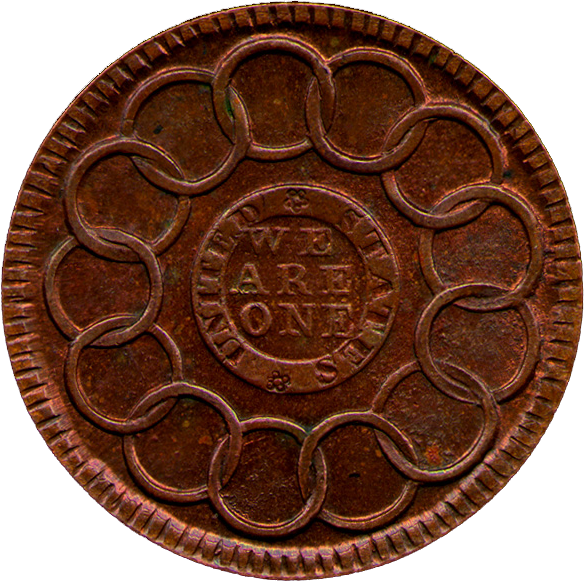 “Fuego Cent” By The U.S. Government, coins.nd.edu. Public Domain via Wikipedia Commons. “Fuego cent reverse” By The U.S. Government, coins.nd.edu. Public Domain via Wikipedia Commons. 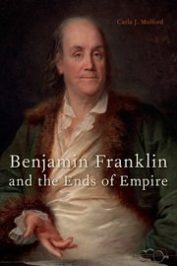 Benjamin Franklin understood the essential necessity of funding the war effort, and he threw himself fully into the work to secure the united colonies’ Continental currency and to secure Americans’ financial and political independence. Americans today celebrate July 4th as a national holiday, one that determined the destiny of the country. The truth is, however, that September 3rd is the more important anniversary to celebrate: on this day, the Treaty of Paris was signed in 1783, making possible an American nation-state and enabling the drafting of one of the most important Constitutions ever known in the West. Featured Image: “Inscription: Benjamin Franklin (1706-1790), Penn Libraries.”Image by POP via CC Flickr. Carla Mulford is Professor of English at the Pennsylvania State University and the editor of The Cambridge Companion to Benjamin Franklin. She is also the founding president of the Society for Early Americanists. She is the author of Benjamin Franklin and the Ends of Empire.